I have a home brewing buddy who did a double boil and a double fermentation and achieved (what he said) 11.4%ABV. I was unfamiliar with this technique and was trying to figure out his math behind it to see if it made sense. Here is what he said. He had an OG of 1.083 and finished off at .0995. That part makes sense, but the metjod to how he got to it is where I got lost. He let it ferment then reboiled it with 3lbs of dark LME and 7 lbs of cane sugar. He repitched it the same yeast. IT was for a 10 gallon batch. It was a Double IPA and had a lot of hop additions, but that is irrelevant to the information I am inquiring about. I have struggled with achieving high ABV (above 9%) and is this metjod a common practice to achieve higher ABV? Is there advantages / disadvantages to this method? Does the math add up? I guess that I would want to know how it tasted....I am no expert, but if my understanding is correct, the boil after fermentation would have driven off the alcohol content of the beer (think how distilling works). Unless he captured (distilled) the alcohol and added it back, any contribution of alcohol from the original steps were lost. He said it tasted smooth and cleared up nicely. That is about all I got from him. i haven't been homebrewing long, but i do know that alcohol boils at a much lower temp than water. if your friend re-boiled his wort (beer, actually) he lost a ton of alcohol in the process. i'm not sure what the LME and cane sugar would produce for alcohol, but you can't really take the previous alcohol content into account. something smells fishy about the math. If he truly boiled the finished beer a second time, then I've never heard of that technique. In addition to boiling off alcohol, I'd worry about off-flavors from yeast lysing. Adding simple sugars near the end of fermentation is a common technique for fermenting a high-gravity beer. It lets the yeast do their thing without having to fight the osmotic pressure of a very high-gravity wort from the beginning. What kind of "struggles" are you having? As long as you pitch a sufficient amount of yeast, fermenting a 9% beer should be relatively routine. It's when you get to about 14% or so that things get tricky. I have just struggled getting my beers to finish where "I" think they should be. I have calibrated my equipment (hydrometer and thermometers) to make sure they are correct. I typically mash in between 150 and 156, mash out at 168 and then fly sparge with 170-175 water for 45-60 minutes. I always try to use a high attenuating yeast, but I seem to have a problem with not hitting my OG (always a little on the low end) and missing my target FG too. I don't miss it by being low, I miss it by finishing out where it should have finished using my target OG or even a little higher than that. I typically shoot for around a 1.070-1.075 range and usually don't make a starter (sometimes I do though), but if I don't I always double pitch. If you're trying to get to 9% ABV, that's your problem right there. You need about 70 "points" of apparent attenuation for 9% ABV. So the OG would need to be at least 1.080, more likely 1.090. I would hope your friend means he boils the sugar addition and then adds it to the beer - that would be a pretty normal thing to do, boiling the beer is not. I still don't see that getting down to 0.995 though. Based on what you've told us, I don't trust his numbers. a10t2 is right, if your OG starts that low you'll have a hard time hitting 9% ABV. Depending on the yeast, even 2 packs may be underpitching. What size starters do you make, when you make them? Sounds shady to me... I agree with Tom on hoping it was the sugar that he boiled and not the beer. Getting that low FG in a not so high abv hints at an infection to me. Typically when I do make a starter I make a 1 to 1.5 liter starter. My wheelhouse is generally the 1.070-1.075 range, but I sometimes try to go higher. I think I have some efficiency issues, that I haven't been able to overcome. For example, I attempted to make and Old Rasputin RIS clone and it didn't hit anywhere near the OG numbers I thought I should hit. Correct me if I'm wrong, but for a 5 gal batch I should have been around 1.092-1.094. I had an OG of 1.084. I mashed in at 153, mashed out at 167, fly sparged for 55 minutes using 172 degree water. 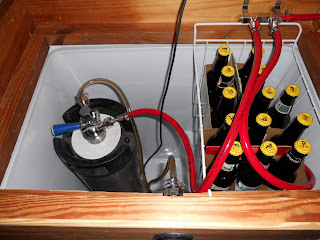 I made a 1.5 liter starter using Wyeast 1028 (London Ale) and then added a Safale 05. It finished out at 1.026 and I was expecting that if I hit my target OG. My thought is if I was 6-10 points off my target OG I should have finished out at 3-5 points below my estimated FG which was 1.022-1.025. It began fermenting at 67 and then raised up to 72 due to lack of temp control. Don't get me wrong, it tastes good (broke into it two days ago), but I feel it could have been better if my numbers hit closer. Back to the original thread: I will have to ask if he boiled the sugar separately the second time then added it to the original beer or if he boiled the beer after first fermentation with the new added sugars. Higher ABV beers usually have lower efficiency so you need to adjust your recipe for how your efficiency goes down as the OG goes up. this doesn't seem out of bounds for that grain bill. you are looking at ~70% brew house efficiency that's about what I get on a big beer.